AVERAGES were up on the year at the annual Dorset May fair in Exeter, with a strong commercial interest underpinning the trade. The leading ram and top call of the day was Pembroke Zest is Best from David Lewis, Narberth, which sold for 2,500gns, to brothers James and Craig Robson, Co Antrim, of the Ballyhammage flock. Born in September 2016, the ram is by Ballytaggart Upstart and out of a Pembroke dam. Mr Lewis also had the top priced individual females. Pembroke Zest, a daughter of Downkillybegs Xchequer, matched the price made by the flock’s prize winning shearling ewe Pembroke Xeter by Downkillybegs Picasso, both selling for 620gns each. Second in the price list was 2,400gns, paid for the horned champion, the Sandy Lane Ultra son Burhos Xtravagant, from Matthew and Adam Care, Cornwall. Also best of the shearlings, it sold to Gary Henderson, Co Antrim. Les French, Launceston, of the Wilsey flock exhibited the first ram to pass through the ring, selling it at 2,000gns. 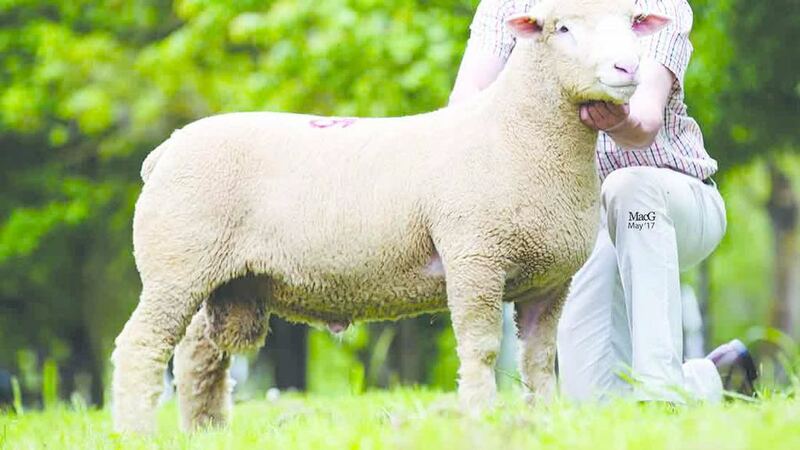 This shearling by South-Win is out of a home-bred dam and was bought by Laura Weir, Ballymena. Two rams made 1,800gns, paid firstly by Joe Larder, Sanford, for the Poorton-sired ram lamb Huish Zeb from David Rossiter, Devon. Mr Rossiter then paid the same for the ram lamb South Ham Zambezi from R. and D. Huxter, Sanford. Burhos Xtravagant sold for 2,400gns. Averages: 122 rams, £775.56; 105 ewes, £208.41; 199 ewe lambs and hoggs, £187.80; 1292 commercial and cross bred hoggs and ewes, £137.78.